BRAAVOO was a collaborative project funded under the Theme 'The Ocean of Tomorrow' as part of the research framework programme FP7 of the European Commission. It started in December 2013 and ran until November 2016. BRAAVOO has developed innovative solutions for real-time in-situ measurement of high impact and difficult to measure marine pollutants. The research leading to these results has received funding from the European Community’s Seventh Framework Programme under grant agreement No. 614010 (Project BRAAVOO). 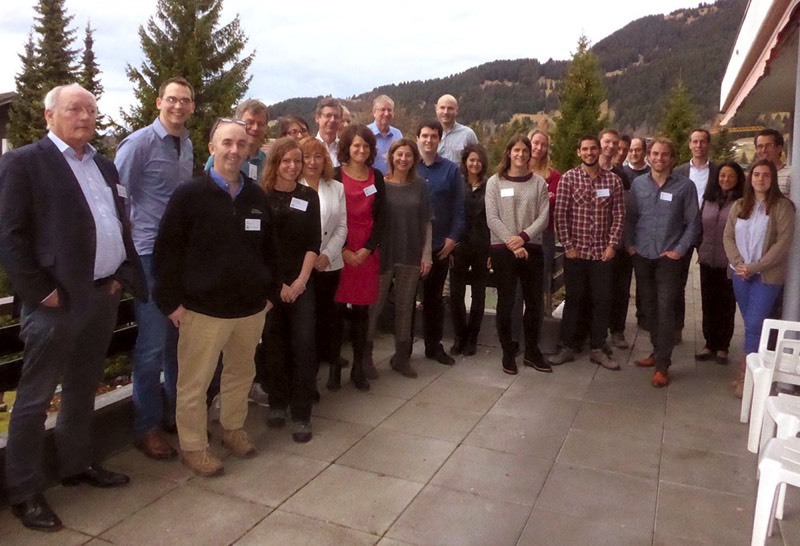 The BRAAVOO final workshop took place on 24-25 Nov 2016 in Villars-sur-Ollon, in the Swiss Alps. The BRAAVOO Project has been the subject of a special Euronews Futuris feature. These 5 technical sheets summarise the BRAAVOO modules. The project flyer introduces to project concept and objectives. The publishable summaries present an overview of the project results. In Sicily a first set of mesocosm and field trials took place, along with a Stakeholder workshop. The BRAAVOO video has been produced during this testing just before the workshop. The BRAAVOO sensors were tested in the ocean in Ireland. Below you will find the mission report for this second set of trials. The increasing use of oceans for multiple contrasting activities will have to be accompanied by improved monitoring of its chemical, physical and biological quality. This workshop focused on the latest concepts and advances in sensing and biosensing to provide better tools for future monitoring. The workshop featured a number of invited talks on key aspects of marine sensing, biosensing and monitoring strategies. In addition, slots were offered for oral presentations selected on the basis of abstract submissions. 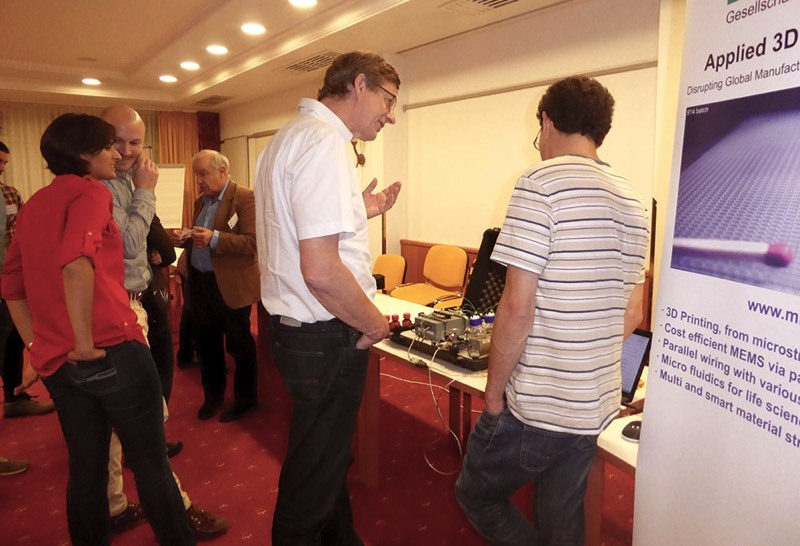 The workshop also had a a display of (bio)sensor modules and tools. The workshop attendees pose for a group picture. 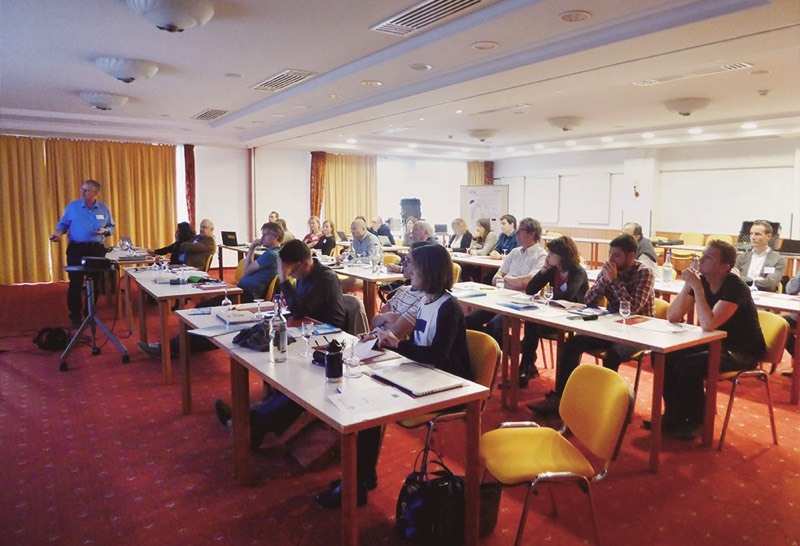 This workshop was intended for interactive discussion about the BRAAVOO project toolbox, results and achievements between BRAAVOO project partners and stakeholders. 2) Feedback and suggestions from stakeholders to overcome gaps and evaluation of possible applications. The BRAAVOO Workshop and Creative Design Course, organized in collaboration with the Envirobot "BioDesign for the Real World" initiative, provided an opportunity for 5 days of intensive learning and hands-on experience in biosensor theory and practice, culminating with the construction and use of both a bacterial biosensor and a field-portable DIY fluorescence detector, that each student will make. The course offered possibilities to design, produce, and test a variety of heavy metal or organic compound biosensors. Course lectures were given in English, and are planned to offer a dynamic and interactive opportunity to explore aspects of biosensor development and use in environmental monitoring. The program furthermore included evening lectures and a visit to the Hackuarium, a local biohacker space. Independent researchers, Masters and PhD students and postdoctoral fellows at the interface between microbiology and engineering were particularly invited to attend. 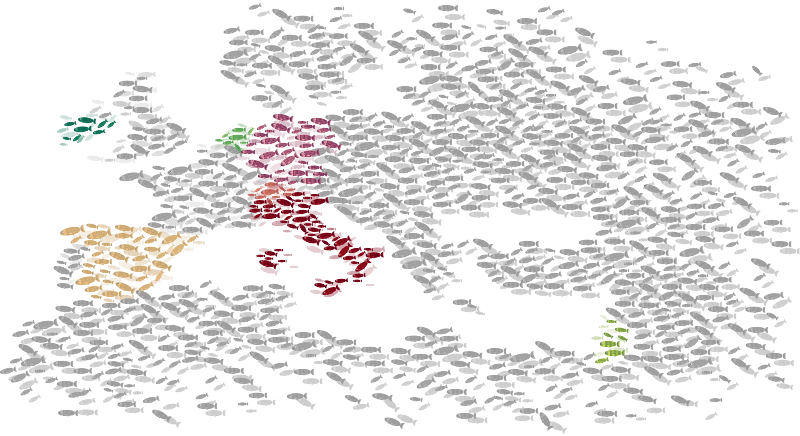 The idea was to encourage multidisciplinary integration of biology and engineering to help solve real-world problems. ...which hopefully will be replaced by the more efficient BRAAVOO USV concept. BRAAVOO aims to develop unmanned surveying vessels (USV) and buoys to carry ‘Lab-on-a-Chip’ modules for real-time monitoring of marine contaminants. Although detecting marine contamination is traditionally quite a logistical challenge, BRAAVOO hopes to transform marine monitoring with the new platforms that will be developed. Fluorescent bioreporter bacteria, immunosensors and algae, provide the basis for biosensor instrument packs to be carried on such USVs. The development of bacterial bioreporters, immunosensors and algal sensors into reliable analytic modules is key to the success of the BRAAVOO concept. Some biosensors are already at this stage, so efforts can concentrate on miniaturization and device integration. Each step of development will be accompanied by precise testing and calibration. Particular emphasis will be placed on securing 'real-time' multisample analysis capacity, either by continuously operating biosensor elements, e.g. microchemostats, or by automated refilling of prefabricated biosensor cartridges. Use of biosensor modules as standalone instruments is also projected. To allow reliable sampling and quantitative analyses for detection of marine priority pollutants, two interwoven engineering efforts will provide the technical basis for the chips and microfluidics support for automated sampling and integration of transducers and electronics. Scheme for the envisioned nano-immunosensor module with all the required units for biofunctionalisation, light control, flow delivery, optical detection, and processing electronics. Together with indoor mesocosms, already available at the IAMC, new outdoor mesocosms are being implemented, this will allow researchers to mimic pollution accidents in seawater and assess detection by biosensor modules. The "outdoor" mesocosm: a new principal tank (22,000 L), has dimensions of 500x400x110 cm. Biosensor signals need to be analysed reliably, whether seas are rough or smooth; and, in the case of a reading above threshold, automatically triggered to collect more vital contaminant data. Automated telemetry-operated marine buoys will be tested under real-life conditions in a coastal area, after the biosensor modules have passed both laboratory-level tests on contaminated marine samples and mesocosm tests to mimic actual pollution. The BRAAVOO consortium comprises 9 partners from 7 different countries, and includes four research groups specialised in biosensor strategies and 5 different small or medium-sized enterprises (SMEs). Two SMEs focus on microengineering, nano-tech solutions for signal acquisition and microfluidics. One SME brings great expertise in algal biosensors and environmental monitoring; another specialises in marine vessels and data solutions for marine sensors and telemetry; and the fifth SME supports the project by dedicated management and dissemination of results. The consortium thereby unites expertise and access to relevant infrastructure and development for the entire range of necessary experimental methods (from maritime engineering to microbiology and nanotechnology) and also allows admittance to marine sites required to achieve its project aims. Together the partners form a unique multidisciplinary network to develop the BRAAVOO concept, which may fundamentally change marine environmental monitoring. The University of Lausanne is internationally respected for its biomedical and biological research. The Environmental and Evolutionary Microbiology group (EEM) is part of the Department of Fundamental Microbiology, both led by Prof. van der Meer. The UNIL/EEM has extensive proven experience in bacterial bioreporters and applications, covering everything from genetic circuitry, design and construction, strain performance, assay calibrations, and field applications, with further experience in using bioreporters within microfluidics chips. The team has previous experience investigating marine contamination using biosensor bacteria, and for the BRAAVOO project autonomous operation of such bioreporters in microfluidic chips will be optimised and tuned to required specifications. LioniX is a leading co-developer, manufacturer and provider of products and components based on cutting-edge micro- and nanotechnology. LioniX provides design to manufacturing and ‘horizontal integration’ by partnering with foundries, suppliers of complementary technologies and R&D institutes. The company specialises in applications of integrated optics, microfluidics and optofluidics, including surface functionalisation, giving them unrivalled expertise in the Lab-on-a-Chip area. The main focus markets include Life Sciences, Telecom, Datacom, Industrial Process Control and Space. Already involved in development of biosensor nanoarrays for environmental monitoring in the EU-FP7 projects BIOMONAR, BIOFOS and SYMPHONY, LioniX will be responsible for microfluidics integration and will also investigate new means of optical signal detection using its proprietary planar waveguide platform for BRAAVOO. The CSIC is the largest public research organisation in Spain, with a main objective to promote and carry out research that contributes to scientific and technological progress. The Research Center on Nanoscience and Nanotechnology (CIN2) is a non-profit R&D Institute, whose main mission is to facilitate research in nanotechnology at the highest level of the international arena. The Department of Environmental Chemistry within the Institute of Environmental Assessment and Water Research (IDAEA) aims to study the source, transport, and fate of environmental pollutants, and also their effects on aquatic organisms and on humans. CSIC-CIN2 has accomplished seminal research on optical transducers, microfluidics, microelectronics and integrated immunosensors. In the BRAAVOO project, it will be responsible for the implementation of photonic immunosensors to target pollutants, and also calibration, validation and testing of the BRAAVOO platform. CSIC-IDAEA, as a renowned marine environmental chemistry lab, will be responsible in BRAAVOO for cross-reference chemical analytics, calibration and verification of individual biosensor modules and marine prototypes, and also collaborate for immunosensor development. Biosensor Srl was founded in 2003 as a spin-off of a private company and scientists from the National Council of Research, with objectives to explore business extensions for the biosensors market and offer a stimulating development environment for young innovative researchers. The company provides expertise in design, prototype fabrication, calibration, testing and product engineering of miniaturised modular automated instruments, mainly biosensors, for biotechnology, agrifood, environmental monitoring and biomedical applications. The main market for these innovative instruments is actually in the EU and Latin America. Previously developed instruments include: multiband and multicell array fluorescence systems; amperometric biosystems and photobioreactors for in vitro cell culture growth. Biosensor is involved currently in the EU-FP7 SENSBIOSYN and BEEP-EC-EN projects and was the industrial partner within the MoMa (From Molecules to Man) project, sponsored by the Italian Space Agency. Currently, it is involved as partner for the development of biosensor experiments for a flight to the International Space Station expected in 2016. In BRAAVOO, their algal photosystem fluorescence signals will be developed as biosensor modules, allowing automated marine monitoring. microTEC develops and produces microfluidics, microsystems and components. With internationally patented production technologies and innovative packaging and interconnection acumen to offer cost, time and space benefits, microTEC translates product ideas into tangible solutions. Specialized in component integration into smaller volumes and parallel mass production, the focus at microTEC is on miniaturisation and polymer-based solutions for development of operational microsystems. microTEC has been involved as an R&D partner in several EC projects, like ULTRA, Light-Rolls and NANOfutures; and for BRAAVOO will enable microsystem integration into marine monitoring systems central to the project. Founded in 2005, SCIPROM is an SME specialised in the management of large collaborative research projects. SCIPROM supports scientific coordinators from the first project idea to the final report, in proposal conception, submission, negotiation and management. Promoting public awareness and understanding of science is an essential aspect of SCIPROM’s services, which generally free partners from the related administrative workload of such large-scale projects. Extensive in-house knowledge about the creation of custom-made collaboration platforms and dissemination materials means project exploitation is also greatly facilitated, a key measure of the ultimate success of BRAAVOO. The Hebrew University of Jerusalem is the leading research institute in Isreal with ca. 4000 current projects and 100 active national and international research centres, many of them interdisciplinary. The Alexander Silberman Institute of Life Sciences is the largest institute at the Faculty of Sciences, whose scientists are at the vanguard of modern biological research. The Belkin laboratory is an internationally recognised authority on whole-cell biosensors, with over 75 peer-reviewed publications covering diverse aspects of bacterial biosensors and attesting to their accumulated expertise in the field. For BRAAVOO, HUJI will tailor bacterial bioreporter strains for monitoring both selected classes of marine pollutants and general toxicity and integrate them into the BRAAVOO autonomous modules. The Institute for Coastal Marine Environment of the National Research Council (IAMC-CNR), composed of six departments and a marine biology laboratory, traditionally deals with issues related to marine sciences, and in particular the domains of biology, chemistry, physics, geology, renewable resources (fishing and aquaculture) and marine technologies. IAMC-CNR is a public organisation aiming to promote wide diffusion of its competences. It has participated as a partner in EU projects specifically dedicated to the study of the potential by marine microbial communities for bioremediation processes and environmental monitoring, like COMMODE, MAGICPAH and ULIXES, and is currently involved in the ERANET Marine Biotech project (www.marinebiotech.eu). Moreover the Institute is dedicated to the study of marine microbial communities associated with extreme environments (in particular, the deep-sea). For BRAAVOO, its main tasks will be to optimise bioreporter performance in marine samples and perform prototype tests in mesocosm facilities. IDS Monitoring Ltd specialises in the delivery and support of data acquisition and telemetry systems for a wide variety of marine and related environmental applications. A large part of its work involves system integration, where sensors, data acquisition and telemetry systems are installed into platforms for short and long -term deployment at sea. The platforms include data buoys, various vessels, shore mounted stations, and floating platforms. Over the last 10 years, IDS Monitoring has invested significantly in developing technology for unmanned autonomous vehicles; and this work provides a very strong foundation for what will be delivered in the BRAAVOO project, data buoys and unmanned surface vessels to monitor the marine environment. If you want more information about the BRAAVOO Project, please use this form to contact the project representatives.